The O'Keefe and Merritt gas range with the Grillavator adjustable broiler, griddle in the middle and original salt and pepper shakers is almost done. Actually, in a holding pattern as additional components are needed for completion including a door hinge, replacement left side panel, chrome top vent and a simmer cap. Progress at the Hooptyrides garage all but stopped as intense Southern California heat made working on anything metal extremely perilous. Early morning work sessions chipped away at the projects as the intense afternoon heat left no option but to hide inside and weep. 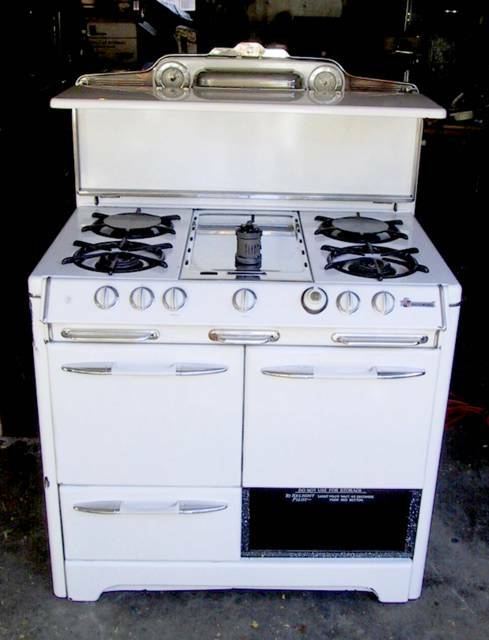 Stove should be done pretty soon and available for purchase.